I adore this busy bag idea! It's a great way to use up plastic eggs if you buy them around Easter or just wait until they go on clearance (like I did) and pick up plastic eggs then. I bought my package of eggs for 99 cents. Per egg, this was kind of pricey, but these eggs have a metallic sheen to them and they are quite large, which was what I was looking for. I bought mine from Joann's. I had everything else on hand to make this busy bag. First, find the egg templates you want to use. I used two different templates (here and here). Print the templates out and cut out the entire egg. Next, cut out the pieces of white felt for the egg white. You only need to cut out one piece of white felt per egg. Once the egg whites are cut out, cut out the egg yolk from the center of the egg template. Cut out the yolk from your fabric. You need one yolk per egg. Now that all the fabric is cut out, pin one yolk to one egg white. Thread your needle with the appropriate colored thread (if you don't have all the colors of thread and do not want to buy all the colors, just use white), and using a straight stitch, sew the yolk to the egg white. Before the yolk is completely sewed on, leave an opening and stuff fiberfill inside. You will need very little fiberfill in total for this project. Once the fiberfill is stuffed inside the yolk, sew the opening closed. Stuff the completed eggs into the appropriate colored plastic egg. 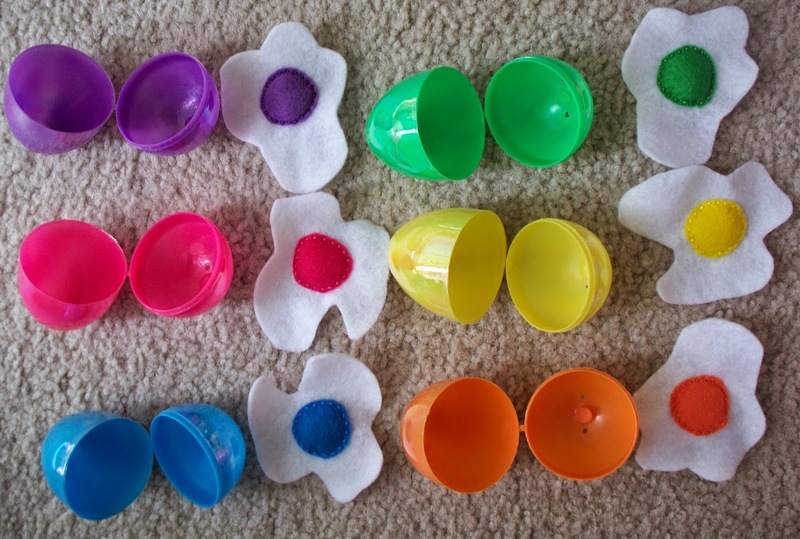 Your child will have lots of fun opening the eggs and matching the yolks to the right egg! The busy bag project is really quick to whip up. I finished mine, after everything was cut out, in about one hour while visiting with family.